A solid vinyl pool cover is the best choice for keeping your pool clean and safe throughout the Las Vegas winter season. Like all of our pool covers, Safe Defenses solid vinyl pool covers are individually made with the highest quality materials and is reinforced to be the strongest and most durable winter pool covers available. When making your selection for pool covers there are a multitude of questions and concerns you have that will factor into your final decision. For most homeowners these include safety concerns, water savings and color selection. Here are some of the most common reasons why homeowners choose Safe Defenses vinyl pool covers. Your vinyl pool cover will be installed to hold taut above the pool surface. This will reduce, if not eliminate, water evaporation throughout the winter months. One of the largest concerns we hear about is how the cover will be held in place and whether the elements of doing such will interfere with the pool area. At Safe Defenses we use flush-mount anchors and tension springs to secure your winter pool cover. These anchors are designed to not inhibit movement around the pool or pool area. While you will be able to see the flush-mount anchors, they are flush with the pool area surface so that they don’t create safety concerns around your family pool while the cover is removed. Over the course of the winter there is no doubt that your vinyl pool cover will keep debris out of the pool. This includes water, leaves, and other debris that, without a cover, would need to be fished out of your pool or pool cleaning system. 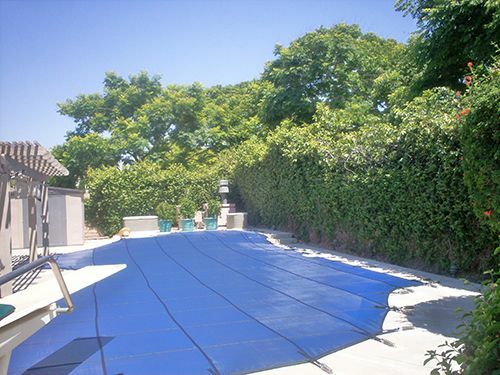 In fact, our winter pool covers are exceptionally strong and reinforced. Just how strong are they? The combined strength of the materials with our professional installation including tension springs, your winter pool cover can support the weight of virtually anything that may wonder onto it, even an elephant. Will It Work With My Waterfall? The most common hesitancy we hear regarding vinyl pool covers is when a pool has a spa or waterfall that empties into their pool, and they don’t think it will work. Actually, our team are experts at making sure that we secure your winter pool cover in a fashion that won’t prohibit normal water flow on most pools. We offer three choices to choose from: blue, green, or tan.